Are Kitchen Devil Knives any good? 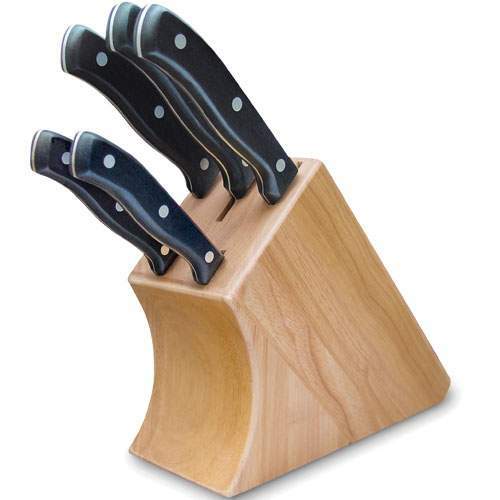 I've been looking at the Kitchen Devil Knives Block at Asda that is reduced to £25 at the moment, are they any good? I had these and after a while (a year maybe) the handles started to come away from the metal and it made them painful to use. Had a few knives for more than 10yrs now, still going strong. After 5yrs, I had to take my friend to a&e as he cut the very end of his finger of with one! decent enough for home use but professionals wouldnt go near them! Had a few knives for more than 10yrs now, still going strong. After 5yrs, … Had a few knives for more than 10yrs now, still going strong. After 5yrs, I had to take my friend to a&e as he cut the very end of his finger of with one! I did that other week on one of my bros chef knives! I now have a flat thumbs! The things we do for a rum, sliced lime and ginger ale! The pros should avoid for build quality purposes but for sharpness, there's not a lot in most blades if kept sharp. I had these and after a while (a year maybe) the handles started to come … I had these and after a while (a year maybe) the handles started to come away from the metal and it made them painful to use. We have the rubber handle ones. we have had some, very dissapointed.. I would take a look in debenhams... they usually have some end of line clearance blocks. you can get expensive knives cut down a lot. I recently got a large set of sabatier knives for £24 very happy with them! We broke one with a rubber handle, when cutting a block of cheese! They have been replaced by a set from Prestige. We broke one with a rubber handle, when cutting a block of cheese! They … We broke one with a rubber handle, when cutting a block of cheese! They have been replaced by a set from Prestige. You do realise they have a 10 year warranty? I decided to plump for the plastic ones as they came with a 15 year warranty not 10!! Good for what? Kitchen use and cooking? Or threatening looters? Personally I prefer the one piece metal knives as the type in the picture above can harbour germs between the handle sides and blade shaft. Personally I prefer the one piece metal knives as the type in the picture … Personally I prefer the one piece metal knives as the type in the picture above can harbour germs between the handle sides and blade shaft. I agree but I find I slip more when using the all metal ones. I have never had that problem, but good knives are an investment and I like to hold and feel them first for comfort and balance in my hand. I remember watching a program on TV that showed how easy they are to shatter. Can't remember what it was though. I needed a new axe for firewood and was stood in the middle of B&Q (or one of the big chains) hefting them in my hand and spinning it to check the balance, that got me a few odd looks. was brought up using these knives in the east end,good for chibbing....very sharp,recommended! Seems a good deal but not really the style I was after! Don't want a see through block! Plus what worries me is reading the comments not many people seem to know the quality of these!